Apply the uni.Logo Motion effect onto your clip. Source: If you want the effect to work on a different video layer, or the current video layer without any other effects applied, you can choose the layer name in the Source drop-down. If left at the default None, Logo Motion will move the current layer including any other effects applied to it. By default, the animation is set to Enter Exit Left for the clip length. Click the Browse Presets button to see animated previews of the 20 presets available. By default, Enter Exit Left is the chosen animation. Double-click any preset to apply. Idle Animation Preset: Choose from 6 options of animations for how the transition makes it to the idle position - Springy, Springy Fast, Wobble X/Y, Pivot Y, Pivot Z, Hover. Modify the duration of this animation with the Idle Animation Speed below. Use Clip Length: Checked on by default, the animation will be set to the length of your clip. Refresh Length: (After Effects only) if you change the length of the clip in your composition, you will need to click this button to update the animation for the new length. Transition Duration: Set the length of time in seconds for the duration of the transitions (enter and exit). Idle Duration: Set the length of time in seconds for the duration of the idle in-between the transitions. Idle Animation Speed: Set the length of time in seconds for the duration of the animation set in the Idle Animation Preset above. Position Start: either type in X and Y values for the position, or use the crosshair to drag it where you want it to be. Scale Start: set the scale for the element. Rotate X, Y or Z Start: set the rotation for the element. Opacity Start: set the opacity of the element. Blur Start: set the blur level on the element. Position Idle: either type in X and Y values for the position, or use the crosshair to drag it where you want it to be. Scale Idle: set the scale for the element. Rotate X, Y or Z Idle: set the rotation for the element. Anchor Offset: set the offset from the anchor of the element. Position End: either type in X and Y values for the position, or use the crosshair to drag it where you want it to be. Scale End: set the scale for the element. Rotate X, Y or Z End: set the rotation for the element. Opacity End: set the opacity of the element. Blur End: set the blur level on the element. Position Offset: either type in X and Y values for the position, or use the crosshair to drag it where you want it to be. Scale: set the scale of the element. Anchor X/Y: set the position of the anchor for the element. Motion Blur: To create a smoother look to the effect we’ve added Motion Blur controls. This group will allow you to simulate a low shutter speed blur and frame blending commonly seen in Film. To turn on motion blur effect, choose Low, Medium or High from the Motion Blur drop-down. Higher quality blurs may affect render speeds. Motion Blur Shutter: A higher number will give you more motion blur on the footage since the it mimics a longer frame exposure. Motion Blur Phase: Allows you to synchronize or desynchronize the timing of the shutter opening and closing with the frame rate of the footage. Since Universe's Logo Motion effect relies on time factors pulled from your composition's information (ex. when the motion starts, when it ends, how long to idle for), it sometimes doesn't seem to work well when used with other effects that also utilize time factors. 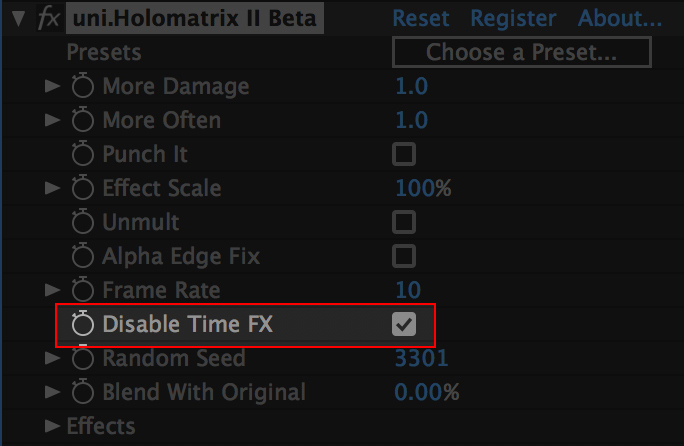 Holomatrix II, for example, will disable Logo Motion when applied alongside it on account Holomatrix uses time variables to determine things like how often it should flicker, glitch, or damage. For this reason, you should use the Disable Time FX toggle whenever it's present if you find your Logo Motion isn't operating properly. If the effect you're using doesn't have this toggle available and seems to disable Logo Motion, try nesting your clip with Logo Motion applied to it into its own composition/timeline, and applying the effect on top of that. You mainly want to allow Logo Motion to work with your composition/sequence's time data without other plugins behaving as a third party between the two.